In 1999 Daniel Ek was a 16-year-old Swedish programmer, getting rich building websites, when he started asking what he himself now says was a dumb question: How do you get people to pay for music that can, if illegally, be downloaded free—and without charging them for each song, the way Apple’s iTunes service does now? Ek’s eventual solution: Spotify, a jukebox in the cloud that provides legal, on-demand access to millions of songs. Supported by paying subscribers, as well as by radio-style ads played only to nonsubscribers, the service debuted in the United States last year after operating for three years in Europe; it now has more than 15 million users, four million of whom pay. 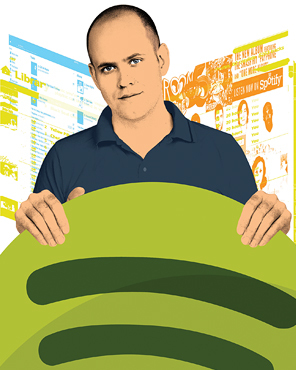 With an estimated value of $4 billion, Spotify is one of the hottest Internet companies in the world. Now Ek is trying to find ways to make it as easy to find and play music as it is to find and play videos on YouTube. This year the company introduced a radio service for computers and mobile devices, launched its first iPad app, and made it possible to embed a Spotify play button into any website. The Huffington Post, the blogging site Tumblr, and Rolling Stone’s website are among the many that now offer music that way. For a man capable of turning his teenage vision into a mushrooming empire, Ek claims a surprisingly simple strategy for continued growth. “I just keeping asking dumb questions,” he says.